CouponFollow's Interactive Teachers Discount Guide helps educators find available savings and rewards programs for over 195 online websites and retail stores. Discounts range from 10% to 50% off for online and in-store purchases, as well as freebies and upgrades. Use the filters below, or scroll down to browse all available offers. Grab our free Chrome Extension to automatically be notified when you can use your Teacher Discount when shopping online! 1. Which of the following applies to you? Select one or more, or skip to view all offers. Exclusive discount on Personal Genetic Service and more for U.S. Educators who join Education Community. See website for details. 15% off for teachers who present a valid ID at check-out. 40% off on Live 10 Standard or Suite + discounts when buying Live with Push. Visit website for more details. Lowest Academic Prices! Sign up to get more special offers. Volume discounts and special offers for Educators. See website for more details. Offer available online only. 60% off on the most popular plan: get the Creative Cloud All Apps plan for only US$19.99/mo the first year, and $29.99/mo after that. 15% off car rentals at over 40 U.S. locations with ITIC card. Advanced reservation required. $25 off car rental. Offer valid for a rental of at least 3 days. Some restrictions apply. 24% off AMC Yeallow tickets. Order your tickets online with ITIC card. Check out Apple Education Pricing for teachers + volume purchase for Schools and Universities! Restrictions apply. See website for more details. Free admission for current Illinois Educators! Register online to receive a voucher. Present the voucher and valid ID at one of the museum’s admission counters. 10% off for all teachers. Select 'Military and Teacher Discount' option at online checkout and get verified via Teacher ID. See if you are eligible for discounts and benefits on wireless services, devices and more. Simply go to AT&T website, enter and submit your work or school email and wait for a message. Up to 25% off car rentals with ITIC card! 15% off for teachers. Offer valid in-store only. Be prepared to present a valid ID at checkout. From 20% up to 25% off for teachers who enroll in the Educator Program. See website for more details. Free membership for teachers at a K-12 school or University who agree to use their Basecamp account only for classroom work. Verification required. 10% off classroom materials! Proof of certification or school identification required at checkout. Offer valid in-store only. 15% off for teachers. Verify online via Sheer ID to get your discount. 20% off all purchases when you sign up for Project Educate. Verification required in-store after you sign up. See website for details. 20% off all items purchased in store if you verify online and join Educator’s Discount Program. This also includes additional benefits during educator events, both in-store and online. To request multiple cards for the teachers in your school email business@booksamillion.com. Special prices available only to U.S. Educators. Call Bose Sales Solution Team at 1-800-353-4207 to get more details. 20% off local moves and 15% Off one-way moves, any day of the week with discount code. Some restrictions apply. Use code: TEACH. 10% off for teachers. Verify via Sheer ID to redeem offer. 30% off for teachers who subscribe to Premium Membership! Unlock further features like grammar lessons, offline mode, McGraw-Hill certification or adaptive vocabulary trainer. ITIC card required. 10% off the lowest available rate at Las Vegas and many other Caesars Entertainment locations! Verification via Teacher ID required. Great deals for Schools and Educators. Contact Canon by phone or email to get more details. Verification required. 10% off for Educators. Verify via Teacher ID and get your unique coupon code to get the offer at checkout. Special pricing for educators through Educator Discount program. Register for an account or log in to get your discount code authorization. Visit website for more details. 20% off for Educators to help them implement Chibitronics into lessons and programs. Online verification required. 15% off Cinemark's Platinum e-Supersaver eTicket. 10% off experience gifts with ITIC card. Free admission with a Florida Teacher Pass! Restrictions apply. Verification required. Special offers for individuals who are employed as teachers or administrators of programs supporting outdoor sports and activities. Online verification required. 5% off for all teachers. Get $20 off each purchase over $200. Verification via Teacher ID required. Restrictions apply. Special offers for U.S. Educators! Visit website to see all available packages. Verification required. Purchase Costco Membership Activation Certificates to join Costco as a new member and receive over $60 in savings. Offer valid online only. Verification via Sheer ID required. Up to 10% off for full-time K-12 teachers. Free Admission for individual visits. Offer valid for teachers and their immediate family. Present either a school ID or a recent pay stub plus driver’s license at the admissions counter. 30% off purchases over $100! Verify online and join The Curious Chef Educator Discount Program. See website for details. Best deals up to 60% off for students. Visit website for more details. Discounted tickets for teachers! Requires verification via Teacher ID. 20% discount for all teachers who sign up with their .edu email. 20% off a new keyboard plus free ground shipping (exceptions apply for Alaska and Hawaii). Visit website for more details. Get 15% off! Verify online via Sheer ID to get a personal discount code. 40% off on select PCs and up to 50% on select TVs and other electronics. ITIC card required. 20% off posters! Offer available online with ITIC card. Some restrictions apply. Use Devon Technologies Upgrade Assistant to get special discounts for U.S Educators. Visit their website to find out more. Visit Blick's website to get great deals for Educators! Also, if your school purchases a large quantity of art supplies throughout the year, call their Institutional Sales Department for details on additional discounts. Discounted magazine subscriptions for Educators. Discounted school supplies and free resources for Educators. Visit website for more details. Up to $75 off 3-day Park Hopper ticket at Walt Disney World Theme Park Orlando. ITIC card required. Create a free account and get exclusive discounts, free shipping on orders over $499, and more! See website for details. Special pizza pricing with VIP Educator Card! Online verification required. 10% off sandals, boots, dress, casual, and work shoes! Offer valid online with ITIC card. 10% off list price on purchases of 20 or more copies of any DPS Acting Edition. Verification required. See website for details. 15% off regular-priced purchase every time you shop in store and more special offers for teachers who join loyalty program. Sign up online and be prepared to show a valid ID at checkout. File for free! If you are a teacher, complete an online form and receive a voucher to file your tax return completely free of charge. 10% off for any product! If you are a teacher, email your proof of employment to sales@ellisigifts.com and receive an online discount code. 15% off! Verify your status online and get a one-time discount code to use at checkout. A new code will be generated each day you shop. Limit one code per day. Special discounts for teachers! Visit website to see if you are eligible and learn more about the offer. 35% off all courses! Offer valid with ITIC card. From 10% up to 15% off car rental at Europcar. Offer valid with ITIC card. 10% off with discount code. Visit website for all current offers. Verification required. Use code: 827B9. Discounted Renters Insurance for teachers. See website for details. Restrictions apply. 10% off and more exclusive offers for teachers who join The Educators Extra Credit Program. Verification via Teacher ID required. 5% off your ticket or package at Festicket with ITIC card. 15% discount on oil changes, maintenance, and repairs. ITIC card required. 5% discount on select LIFEBOOK notebook and Tablet PCs. To receive the discount, call 1-800-FUJITSU. 15% off for teachers! Call (407) 396-6300 and refer to the special Teacher Appreciation Rate Offer. Verification required. Special discounts for U.S. Educators! Fill out an online form and a representative will be in touch. Join Get MORE Rewards Club and get special discounts on your order - the more you buy, the more you save! Visit website for more details. Exclusive discounts on insurance rates for Educational Organization Members. Visit website to check if you are eligible. Get 25% off your online order! Verify online to get the offer. Educator Discount on the purchase or lease of an eligible Chevrolet, Buick or GMC vehicle. Restrictions apply. Verification required. See website for details. 20% off your order! Verification with ITIC card required. Restrictions apply. 25% off your entire order of full priced GEAR and EVENTS. Verification via Teacher ID required. 10% off for teachers who sign up for Educator Discount Card. Offer valid in-store only. 15% off with your ITIC card. $10 off your booking! Must spend $75. ITIC card required. 10% off in select restaurants on food and non-alcoholic beverages. Present a valid ITIC card when placing your order. 15% off accommodations for teachers and educators. Book online with discount code. Restrictions apply. Verification required. Use code: Teachers. Teacher Appreciation Rates and more at Hilton Orlando Bonnet Creek! See website for all available discounts. Save money when you buy, sell, or refinance a home. Visit Homes for Heroes website, complete an online form, and learn how much you can save! Special discounts for Educators on auto, property, and life insurance + Educator Advantage® program. See website for more details. 50% from the list price of the home through Good Neighbor Next Door Program. In return you must commit to live in the property for 36 months as your sole residence. Visit website for more details. 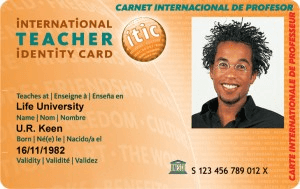 $100 off various TEFL certification courses with ITIC card. Intuit Education Program offers Educators and Schools complimentary QuickBooks Online, QuickBooks Desktop, and ProConnect software. See website for details. 15% off for U.S. Educators. Present a valid Teacher ID at checkout. Offer not valid online. 15% off for teachers who register for JOANN Teacher Rewards Discount Card. Verification required. Special discounts on software and technology products. Verification required. 10% off car rental! Book directly with JUCY, advance reservation is required. Not valid with other discounts. ITIC card required. 10% off for Educators. Verify via Teacher ID and get your unique coupon code. From 30% up to 80% off teacher supplies! 20% off for teachers. Verify online to get your discount. Special discounts for Educators. Verification via Teacher ID required. The Educator Study Pass offers Florida, Georgia, Puerto Rico and U.S. Virgin Islands Teachers complimentary access to Kennedy Space Center’s Educator Resource Center. To receive the pass get verified at Will Call at the entrance to the visitor complex. See website for details. Special discounts and terms for local Educators. This discount encompasses everything from instruments and accessories, to repairs and rentals. Fill an online form to get more details. Get exclusive pricing on bulk orders at KwiCo. 15% off in-store purchases + exclusive offers for Teacher's Club Members! Visit website to download registration form. Exclusive offers available for Educators! Visit website and check out all available offers. Free Florida Teacher Pass! Show your most recent pay stub, current Florida photo ID, and valid FDOE Professional or Temporary Certificate at the ticket window. Restrictions apply. From 10% up to 5% off top-performing Think and economical Idea Lenovo brands! Verification required. See website for details. Educators get special savings on car insurance. It includes Vandalism Loss Protection, Personal Property Coverage, and Collision Coverage. See website for details. 15% off and more for teachers who join Loft Loves Teachers Program. 30% off Lonely Planet Guides. Offer valid online with ITIC card. 12% off luggage shipment for ITIC cardholders. 15% off when you shop at Madewell stores and show a valid Teacher ID at checkout. Offer valid in-store only. Exclusive discounts and more for teachers and school personnel. See website for details. Restrictions apply. Verification required. 5% off for Educators! Enter a discount code when making your reservation online. Use code: Educator. 15% off entire purchase including sale items. Offer valid in-store only. Be prepared to show a valid ID at checkout. Restrictions apply. Office 365 for free and 10% off Windows devices! See website for more details. 25% off for Educators. Make sure to order using your ".edu" email address. Use code: 25off4edu. 2 Complimentary Tickets to select Monday home games, additional bonus dates, and special ticket offers throughout the season. Offer valid for licensed K-12 teachers. Verification via Teacher ID. Restrictions apply. Shop discounted school supplies and save up to 70%! 15% off with ITIC card. Get three free months of cellular monitoring, installation at $89.99 (less than half the normal rate) and a monthly subscription fee of just $34.99. The package includes the alarm, cellular communicator, remote key fob, motion detector, window and door sensors. Special discount for U.S. Educators! Simply email info@nakedbinder.com or call 877-446-2533 and receive your promo code. 10% discount for Educators with ITIC card on NASCAR events. Geno 2.0 Kit Educator Discount: get one for $140 (includes shipping and handling). Verification required. Teachers who plan to use the kit for educational purposes to augment the curriculum within a formal classroom environment or home school will be considered for the discount. Special offers for Educators. Browse website for exclusive discounts on teacher supplies. Up to 85% off magazines. Special deals for Educators on most popular magazines. 50% off for both online and print subscriptions for Educators. Verification required. Special offers for Educators who are Office Depot® OfficeMax® Rewards Members. Get 2% back in rewards on everything, members-only savings + more. See website for details. 10% off for Educators! Verify via Teacher ID and get your unique coupon code to get the offer at checkout. Up to 65% off! Visit website and browse discounted teaching supplies and stationery. Free admission with valid school credentials (teaching certificate, school ID, or a copy of most recent pay stub). Restrictions apply, see website for details. 10% off and Free Shipping with ITIC card! Free Club O Gold memberships for teachers. This includes free shipping, extra Rewards Dollars, and more. Verification via Teacher ID required. 25% off your online purchase for local pick-up or delivery! ITIC card required. From 10% to 20% off for all schools and non-profit organizations. Offer valid in-store only. See website for details. 10% off! Visit website and get verified through the online form to redeem the offer. Pets in the Classroom is an educational grant program that provides financial support for Educators to purchase and maintain small animals in the classroom. Visit website and learn more! 20% off the best available rate + special amenity! Book online and verify your eligibility at check-in. 10% off live event tickets and VIP packages. Offer valid with ITIC card. Educators, teachers, and homeschooling parents receive a special discount at Prince Resort. Book online. Verification required at check-in. 10% off for Educators! Verification with Teacher ID required. See website for details. 15% off! Verify online via Sheer ID to get a one-time coupon code. Get 28% off on print at home tickets with ITIC card. 25% off Rosetta Stone. Verify with ITIC card. 20% off your next order with an academic discount! Online verification via Sheer ID required. Join Educator Discount Program to get exclusive discounts on the latest Samsung TVs, phones, appliances, tablets and more + great trade-in programs, free shipping and low monthly payments. Sign up with your .edu email. 20% off first purchase, first access to exclusive offers and more for teachers who join Saucony VIP program. Verification via Teacher ID required. 15% off Scanmarker Air! This digital highlighter scans editable text directly into your device, saves your time, provides instant translation into 40+ languages and reads aloud the text while scanning. Browse Scholastic Teachers Store to get exclusive deals. Complimentary SeaWorld Florida Teacher Card for all active and certified K-12 Florida grade school teachers. Verification via Teacher ID required. Save up to 70% off at National Geographic store! Exclusive discounts for Silhouette products purchased through SilhouetteAmerica.com. Contact education@silhouetteamerica.com to verify your eligibility and redeem the offer. Visit website for more details. 5% off for teachers and School Administrators. Valid for prepaid rentals at U.S. locations. Valid School ID must be shown at rental counter. 10% off for teachers. Verify via Teacher ID. Get a Complimentary Speed Stack Set for your School! 15% off, free shipping and more for teachers who join Teacher VIP Membership program! Verification via Teacher ID required. Exclusive discounts for Educators via Sprint Works Program. See website for eligibility details. Verification required. 50% off your first full year of Squarespace by signing up with your academic email address. Exclusive discounts and special offers for Educators. Visit website to view available offers. Verification required. Discounts on select popular magazine subscriptions! If you add the offer to your cart, you must provide current school information during the checkout process to qualify for the lower rate. Up to 90% off! Take advantage of education discounts on software, robotics and technology products. See website for details. 15% off earphones and headphones. ITIC card required. 10% off Shared-Ride and ExecuCar/SUV. ITIC card required. Special pricing available for Educators. Visit website for more details. 15% off all full-priced purchases, in-store only. Valid Teacher ID required at checkout. $5 off $50+ purchases with ITIC card. Browse unique offers and find out where you can go next with Teachers Travel Web! 15% off travel safe clothing! Special discounts for Educators who join Organized Teacher Discount Program. Verify online and receive your first offer, redeemable in-store, online or by phone. 20% off The Economist subscription with ITIC card. 25% off valid all year round! See website for more details. Verification required. Popular computer software programs at discounted prices. 15% off all used class sets. Add 20+ used books to your shopping cart and enter discount code at checkout. All items are eligible for the discount except ThriftDeals, new books, and gift cards. Use code: APPLE. 25-50% off organic & healthy groceries delivered to You! Free Thrive membership for teachers. Verification required. Access to weekly print and digital editions for as low as $4.50 per student. Save $100 on smartphones and tablets: activate a new line and save on your device. Exclusively for K–12 staff and college staff. Call in only offer. Verification required. See website for details. Additional 15% off for U.S. K12 teachers and Collage Faculty. At online checkout select Teacher Discount option and verify via Sheer ID. Some limitations apply. 10% off for teachers who verify via Sheer ID. 20% off travel backpacks! Offer valid with ITIC card. 30% off Trace Me Luggage Tracker Security Tag. ITIC card required. 10% off the best available rate + select dates that can save you even more! See website for details. Verification required at check-in. Free Shipping and Better Exchange Rates. Offer valid with ITIC card. 10% off for ITIC cardholders. Experience the excitement of two spectacular theme parks - Universal Studios and Universal's Islands of Adventure. Over 45% off classroom subscriptions, exclusively for Educators. See website for details. Special discounts for active or retired teachers! Visit website to see all available offers. Verification required. Monthly discounts for Educators! Sign in online to see if you are eligible. From 10% up to 50% off with ITIC card! Special room rate at Walt Disney World Swan and Dolphin Resort. Book online or call 1-888-828-8850 and ask about Teacher Rate. Verification required. 50% off the digital subscription for K-12 teachers. Online verification required. Additional 5% off of already discounted prices for Full Time Public School Teachers. Fill out an online form to get more details. 15% off West Elm! Verify online to get the offer. Up to 20% off for Teachers, Administrators and Staff at educational institutions + Free Standard Shipping offered on all orders. Online verification required, visit website for more details. 10% off for teachers and School Administrators! Use discount code online or call 1-877-288-7422. Valid ID required at check-in. Restrictions apply. Use code: EDUCATORS10. Special discounts at participating Wyndham Hotel Group hotels. Book online with their government discount or call 1-800-407-9832 and ask about government rates. Valid ID required at check-in. Some restrictions apply. 20% off any Level 1 Foundations Training! Apply online prior to purchase and 30 days prior to the training event. Yoobi Classroom Packs available for classrooms where at least 70% of the student population is enrolled in the federal free or reduced lunch program. Visit website for more details. Did we miss one ? Let us know using this submission form, or in the comments below. Never miss a teacher discount again! Specially crafted for educators, this free extension notifies you when you can use your educator discount at supported stores. Teachers go above and beyond everyday, and are at the core of educational growth in the USA. They deserve to get a break every once in a while! In this interactive guide we've organized discounts from retailers and websites who offer up special pricing, freebies, and savings to the hard working Teachers and Educators in the US. We've collected as many discounts as we could find and organized them on this page, which is continually updated by our team. However, community feedback from Teachers and Faculty is extremely important to keeping our offers up to date. Use this form to submit a coupon, or send us feedback here. Please note that some teacher discounts require enrolling in a membership rewards program or having a special identification card, which are described below. While many offers don’t require you to have an ID card, they do require some type of proof that you are a teacher. If your school does have a Teacher Identification card, you should carry that with you when making in-store purchases. TeacherID by ID.me is a great way to easily prove you are a Teacher at dozens of online shops that you may frequent. Once you scan your ID at ID.me, their wallet saves your ID card so that you can prove eligibility for teachers and educators discounts. Once you have TeacherID, you can look for the logo at checkout and unlock savings instantly. Are you a full-time teacher? If you so you are likely eligible for ITIC. Teachers who work more than 15 hours per week get special access to thousands of local and international benefits. ITIC lets teacher and educator cardholders gain access to over 125,000 local offers at over 2,300 US locations. Plus dozens of special discounts to online shops like Target, Papa Johns and more. Cost of card starts at $20 for basic benefits, up to $199 for various travel and insurance benefits.